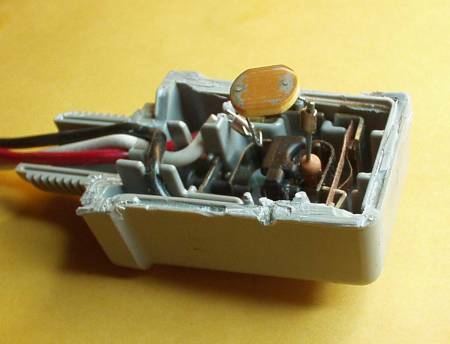 The internal workings of an Intermatic photocontrol. haha cool. I just replaced one of those exact models @ my shop. That particular photocell gets replaced over and over, many times more than a quality one. It also has the added feature of taking on water because of the mis-aligned threads from the 2 piece construction if you can even thread it in, and they often don't shut off until 10AM. Keep a few in the truck for your cheapest customers. I'm sorry to hear of your problems. I have used this particular model many times, with generally good results. Indeed, it has performed better than most other makes it has replaced. True, it is available in a heavier-duty model .... and the most common problems involve circuits that really ought to be on a contactor. I "sacrificed" this one by opening it up with a hacksaw. A heavier duty one would have been too hard to cut. they often don't shut off until 10AM. I almost always use a photocell / timer combination. Its an easy upsell.